At Ireland and Scotland Luxury Tours we always advise clients to visit the Cathedral. 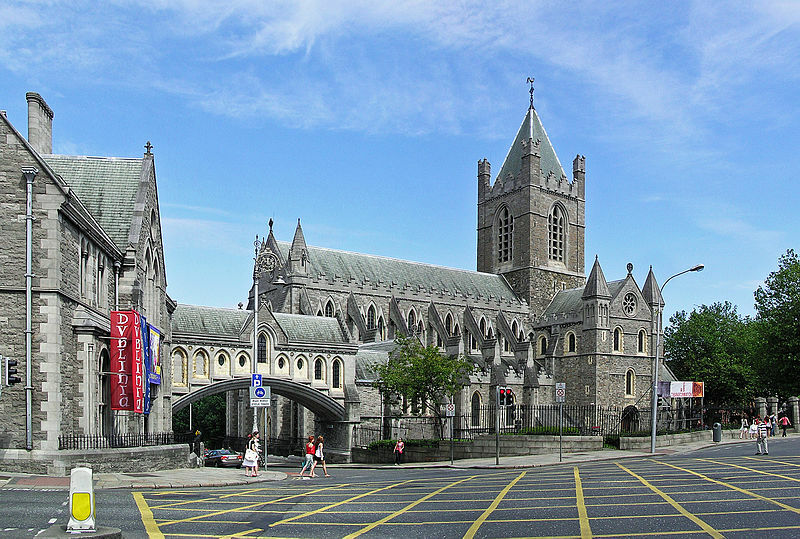 A Cathedral was founded on the location in 1038 by Sitric, King of the Dublin Vikings. It was for the first Bishop of Dublin. Even though it was a simple wooden building it survived for over 100 years. The existing Cathedral is the oldest church in Dublin. The famous “Strongbow” of Irish legend started the rebuilding of the church in 1169. It was to be built in stone. But “Strongbow” died in 1176 and never saw the church completed. Nor did the Archbishop of Dublin “Laurence O’Toole” who died in 1180. When the Cathedral was finished “Strongbow” was buried in the nave. The tomb is still there to be seen on your tours of Dublin. The Cathedral is one of the best Irish examples of early Gothic architecture. It features “the leaning wall of Dublin”. This is the North nave wall which has leaned 18 inches out of the perpendicular since 1562. Also don’t forget to visit the crypt. Our favourite there is the punishment stocks.